In the tumultuous years that followed the 'split' in Irish football along political lines, both associations claimed authority over the whole island, and the right to be considered the true "Ireland" football team. As such many players represented both the Irish FA (what is now Northern Ireland) and the FAI (what is now the Republic of Ireland, but known initially as the Irish Free State, then Eire from 1937). In more recent years the FAI have been taking advantage of the Republic of Ireland's citizenship and a number of Northern Ireland-born (and capped at various levels) players have turned out for the Dublin-based team. However, the first player to have been capped by both nations was Alex Bruce, the IFA taking advantage of the fact he was only capped by the Republic in a friendly match, so he was not permanently tied prior to his Northern Ireland debut against Malt ain 2013. Kevin O'Flanagan was awared "Victory" and Amateur caps by the IFA and Full caps by the FAI (10/3 1937-1947). Ed (Ned) Brooks played for an Irish Free State XI in 1924, scoring a hat-trick against the USA, and also played once for the IFA in 1920. Tony Kane has been capped by both Northern Ireland and the Republic of Ireland at Under-21 level, and has been included in the Northern Ireland "Full" squad. The only other player to have won full international honours for both (Northern) Ireland and another country was Jack Reynolds (5 Caps/1 goal for Ireland 1890-1891 and 8 Caps/3 goals for England 1892-97). Born in Blackburn, but raised in Ireland, Reynolds played for the Irish before his actual place of birth was discovered, at which point he switched allegiances. A number of other players have represented another country at non-senior level before representing Northern Ireland. These include Lawrie Sanchez, Kingsley Black (both England Schools) and Brian McLean (Scotland Youth). Alan Kernaghan and a number of more recent players have played for Northern Ireland Schools before being capped by the Republic of Ireland at Under-21 or Full level. Dave Clements represented the USA (as Team America) during the Bicentennial Cup in 1976 against Italy, Brazil and England. The Italian and Brazilian FAs regard their matches with Team America as Full internationals, but the (English) FA do not. No caps were awarded to the 'American' players. A number of Northern Ireland other players have played Inter-League football for whichever country they were employed in at the time (including Jimmy McIlroy, Danny Blanchflower, Norman Whiteside and others). 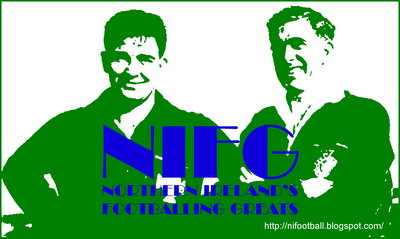 On a similar note, Jackie Milburn and George Eastham Junior both played for England and the Irish League. There are undoubtedly other cases. Ned Weir IFA 1/0; FAI 3/0. Also, although Walter McMillen played for IFA, he did not play for FAI. It was Billy McMillan who was capped in 1946. You are of course completely correct in all cases. Hopefully I would have spotted these errors/omissions when looking at these players in more detail. I will update the list accordingly (thanks!). Just a slight footnote, Billy McMillan played for (Northern) Ireland in the post-World War 2 Victory Internationals (but never won a 'full' cap), and was one of only a handful of Northern-born players to represent the FAI. Thanks RW. I've been intending adding a complete set of stats for inter-league matches (both War and peace-time) which will add more details on Sagar and many others. Often overlooked in these times of players declaring for one country or another is the fact that ALEX BRUCE is the latest player to have played for both Ireland's (although I notice he still has to make an appearance in your excellent player profiles section). Fair point, update to follow. Alex's profile is linked from the current squad page. He'll get added to the alphabetical pages at the end of the year.